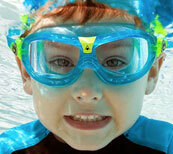 Our focus is delivering specific types of Swim Goggles to suit your individual needs. 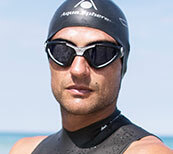 For help selecting the right pair for you, see our Swim Goggle Guide. Born in 1998 in Genoa, Italy, Aqua Sphere began a quest to create the most comfortable swimming goggles. The innovative Seal Swim Mask was truly revolutionary, introducing unparalleled peripheral vision with its patented curved lenses, easy-to-adjust straps, and Long Lasting Comfort. Aqua Sphere continues to lead the industry, developing technologies that improve performance, fit, and comfort in any use, casual or athletic. The “Aqua Sphere Difference” starts in Italy with superior research, craftsmanship and design. It is this great “vision” and commitment to quality that drives development of all Aqua Sphere swim products and the advanced range of MP Michael Phelps competition swim gear. No two faces are alike. Understanding facial geometry is both an art and a science. Every year, our Italian design team continues to refine and improve the fit of our swim goggles and masks to offer an optimised fit, unequaled comfort and performance to the widest possible range of facial shapes. Looking for an edge in performance? Utilise our most advanced technology to achieve the optimum balance of vision and hydrodynamics without sacrificing comfort. If your training in a pool 2 or more times a week then these goggles are for you. Designed with comfort as the priority, while utilising materials to ensure durability and longevity. Just looking to have some fun around the pool or the beach this summer? These swim goggles are designed for hassle free, leak-free fun and engineered with value in mind. 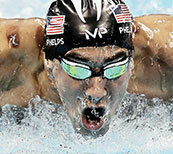 The MP Michael Phelps Range will give you the competitive edge. They utilise our most advanced technology in a low profile design to achieve optimum hydrodynamics. Our Range of Kids Swimming Goggles are designed for children as young as 2 years old and feature the very best in Aqua Sphere technology, to create the perfect fit for younger faces.